First clean the bottle, let dry. 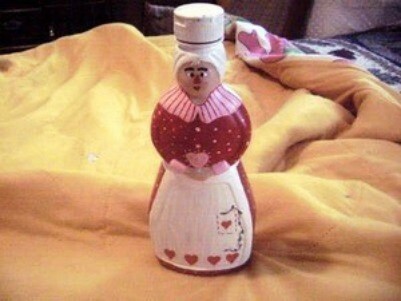 Spray paint and let dry, then paint the bottle like the one in picture. I have done several different mrs buttersworth but not one like this. I love it! cute cute cute, wish i had good ideas, lend me yours,haha, im gonna show my 5yr.old grandaughter this, i might try one, im no painter though.haha. thanks. Never seen one this sweet...good job! I love Valentine's Day!